Today I rode 101 miles to express my gratitude for all of the unseen heroes who work at Domestic Violence Coalitions, Child Advocacy Centers, Court Advocates, Crisis Centers, Hotlines, etc… These devoted individuals work tirelessly with little thanks and often times in situations that are quite depressing, day in and day out. Today was your day! All of you who work to protect children and women in need were in my thoughts and prayers today as I pedaled in the most perfect weather for bicycling. Thank you everyone, I am grateful for the very important work you do to help those in need. The hand written thank you is a very powerful expression of one’s thoughts. It has become part of One Million Acts Of Kindness now and forever. I hand write thank yous and try my best to get names and addresses of those who help lend a hand as this wonderful mission unfolds. I wrote about this in early April and it is amazing the response I get from people who receive one of my thank yous. I admit that I miss a few names or I can’t find the address of the person once I leave town, I’m hoping to get better. I’m vowing to get all of the DV and CAC heroes thank you notes by years end. Keep an eye on your mailbox. 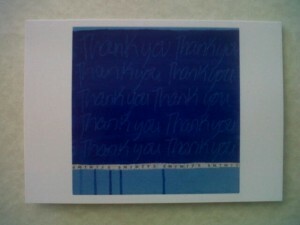 Today’s photo is a of a thank you card from www.gratitudedesigns.com I use these thank you cards because of their tie to helping children through www.flawlessfoundation.org More very good people helping children in need. **Near ride’s end today, I met a great group of KSU students who called out for me to stop by for some water. I got to meet Sage, their dog, who was enjoying the game of “washers” they were playing. Thank you guys for making my last mile much easier. This entry was posted on Sunday, September 4th, 2011 at 8:00 am	and is filed under Kindness. You can follow any responses to this entry through the RSS 2.0 feed. You can leave a response, or trackback from your own site.